Today marked Motorola’s first device unveil event since being purchased by Google earlier this year. Not only are they under new ownership, they are under new management with former Google Exec Dennis Woodside at the helm. Today’s event was touted as a new beginning for the big M and boy did they come out swinging. Motorola unveiled 3 new smartphones – The Droid Razr HD, Droid Razr HD Maxx, and Droid Razr M.
Not only did Motorola unveil 3 new powerhouse Android devices, they also took a lot of jabs at their competition throughout the event. At first it was mainly Apple who bore the brunt of the trash talk, but Moto also poked at the likes of HTC and Samsung to firmly place their new Razr trio above the competition. Motorola also announced plans to update all of its 2011 smartphones to the latest Android 4.1 Jellybean platform which was a pretty big deal. Now if you have a phone that isn’t slated to receive Jellybean, its not all bad for you though. Motorola will be giving any owner of a non upgradeable device a $100 credit towards the purchase of any of the devices announced today, which is quite nice of them. Now for the specs breakdown. Take a deep breath. As you can see from the specs above, these new Razrs are quite beefy. All 3 will be Verizon exclusives as it stands now and will be sporting LTE so you can put all that speed and HD glory to good use. 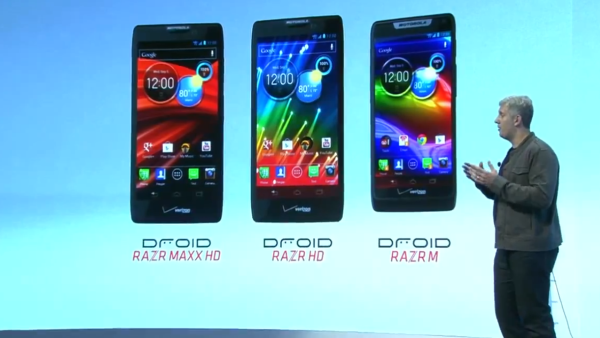 The Razr M will be available next week, though no word yet on the availability of the Droid Razr HD and Razr HD Maxx. If you’d like to watch the full “Motorola. On Display” event, check the source link. So I know we’re excited … how about you guys?